I’m not a tour person. I like to do things at my own pace and decide myself what I want to see and when. I can get a little irritated if I feel like a sheep following a bunch of other sheep following the shepherd who is bored with taking yet another set of tourists asking stupid questions to see the same old thing. But I digress …. While there is certainly a place for a tour, you don’t always need one. But if you do decide to go tour-less, what you need is advice to help make things easier. So, here you go — lots of detail here, scroll down if you don’t need it all. If you’re like me and don’t like tours, don’t speak very much Spanish, but can afford a touch of time for mistakes, bad timetables, planning, et cetera, here is how to see Machu Picchu independently, without booking a tour. All prices quoted are for December 2014 and using exchange rates at that time. Most people fly into Lima and then fly to Cuzco (you can take the bus, but you need to break it up as I believe the complete trip takes 20 hours). You’ll likely need to spend a night in Lima too, given the flight schedules. You can book a car to take you to/from Lima airport to Miraflores (a popular neighbourhood for tourists) for $18-$22 US. A taxi might be less (but might be more). This scenario is unlikely to happen, but I was warned: keep your bags in the trunk or difficult to see in the car (eg under your legs). There have been some reports of thieves breaking a car window and snatching a bag at a stop light. Keep aware of anyone near your car when you’re stopped. Most likely you will just see people selling snacks, and, if you’re lucky, a juggler or tumbler or two hoping you’ll reward them with a bit of change. Booking your flight: Some of the prices for domestic flights can be deceiving, as some airlines charge a “gringo tax” to non-residents on top of the regular fare. Peruvian Airlines is the cheapest flight to Cuzco. LAN has good prices too, and is your only gringo option if you want to go to Lake Titicaca from Cuzco (Juliaca is the airport). Neither charge a gringo tax. One challenge to be aware of is that several airlines require a Securecode credit card to buy the ticket online. But if you’re in Lima it is easy to drop into one of the airline offices (e.g. Peruvian and LAN both have one in Miraflores, near Kennedy Park; and LAN has an office on Cuzco’s Av El Sol). There is a small fee (approx $5 US) to buy in person. My one-way ticket, bought just two days in advance of my flight, was $102 US. Unless you’re doing the Inka Trail, you are better off to acclimate to the altitude in the Sacred Valley. In Sacred Valley towns like Ollantaytambo, the altitude is 2792 meters above sea level (9160 feet), while Cuzco is 3400 meters (11,150 feet). Machu Picchu is only 2430 meters (7970 feet). 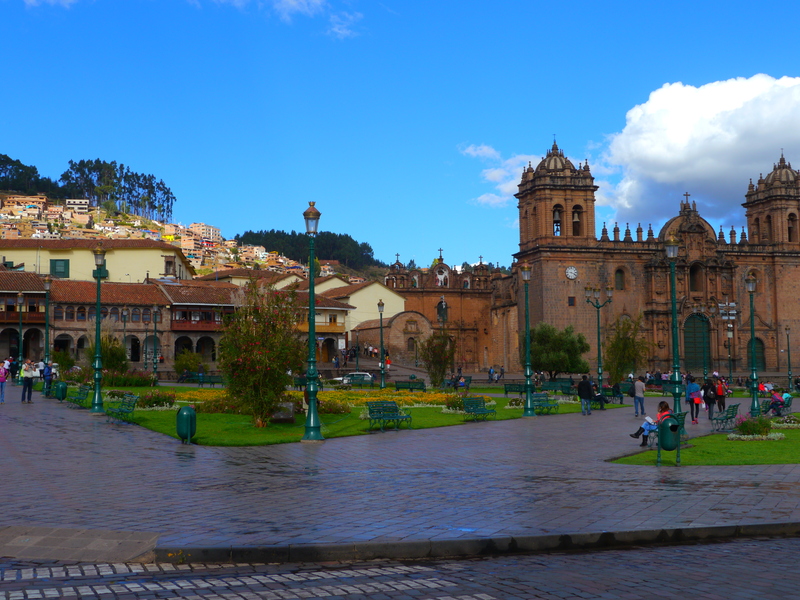 If you start your trip in Cuzco, you’ll be hit by fatigue at best, altitude sickness at worst. And unless you have 45 days to build up your red blood cells, you will huff and puff on any incline! (Tips to avoid feeling sick: drink lots of water, try a little coca tea, take it easy, and don’t eat too much when you first arrive). More detail on preventing altitude sickness is on the Peru page). You have several options to get from the Cuzco airport to one of the towns used as a base for Machu Picchu. The major towns, in order of furthest distance from Machu Picchu, are Urubamba, Ollantaytambo (also called Ollanta, and don’t forget that “ll” is pronounced as “y”), and Aguas Callientes (also called Machu Picchu Pueblo). While you can use Cuzco as your base and take a day trip to Machu Picchu, you will lose a lot of your day to travel. 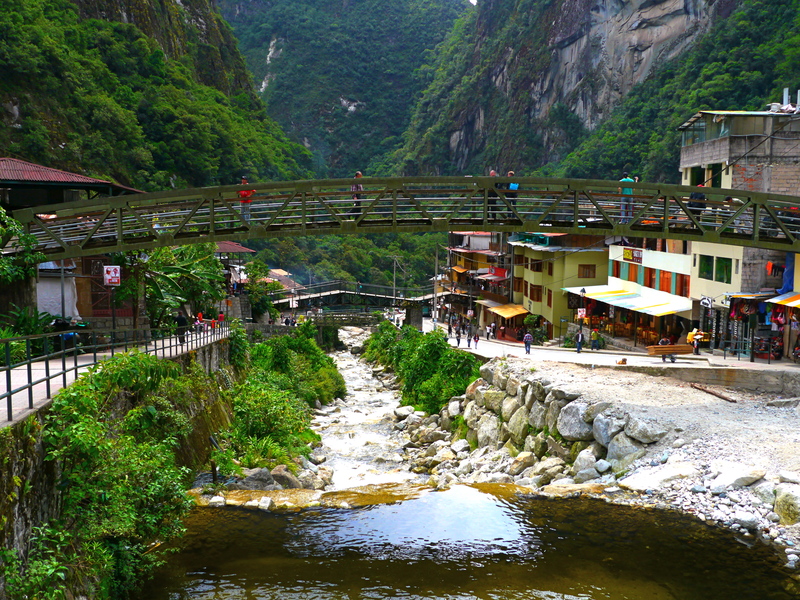 You can take the train all the way from Cuzco to Aguas Callientes, the base of Machu Picchu. You must take the train at least for the last leg from Ollantaytambo to Aguas Callientes — there are no roads. There are lovely trains (super-high-end Hiram Bingham), as well as the panoramic Vistadome train and the Expedition backpacker train (which also has great views and ceiling windows). There’s not a huge difference between train services, so just pick the time and price that’s most convenient for you. While a locals-only train exists, foreigners will receive a fine if they are caught taking it; you need to show ID (passport) to buy any train ticket. You can catch a taxi from the airport to Ollantaytambo, which will cost 120 Peruvian soles ($41 US) — a good option if you are a small group. Or, with hardly any difficulty, you can take a short taxi and then a “collectivo” minivan. In the Lima airport (air-side) there is a tourist information booth with a helpful lady who will give you a map showing the collectivo street and tell you approximate prices (which are indeed approximate). First, you need to take a local taxi to the street where the collectivos collect their passengers. The street is called Pavitos and every taxi driver will know it. If you take a cab waiting at the airport curb they will ask for 30-35 soles ($10-12 US). In English, I negotiated this down to 20 soles ($7), but I later learned 10 should be standard. If you walk out of the airport parking lot (2 minutes) and hail a cab on the street I’m told you can get a cab for 8-10 soles (around $3). The ride to Pavitos Street will be about 12 minutes. Tell your driver which city you want to bus to (although the “bus stops” for each city are all on the same street and clearly marked in big letters). I went to Ollantaytambo, and though the Lima airport tourist information lady said the price would be 15 soles, I was charged only 10 ($3.50 US). There are a few styles of minivans, but most seat about 14 people (from back to front, a row for 4, a split row of 2 and 1, another of the same, then a row of 3, plus the front passenger seats). The seats aren’t huge, but comfortable enough and have some leg room. If you have a small bag (mine is 40 L) you can fit it on the floor in front of you between your legs. There’s a roof rack too. Most of your fellow passengers will be friendly local people. The bus leaves when full (it shouldn’t take more than 15 minutes). The drive is about 1.5 hours, and the scenery is gorgeous. Bring water — you don’t want to get dehydrated at altitude (but don’t drink too much because there are no washrooms onboard!). You pay when you exit. Exact change always beneficial. Road signs for the towns aren’t super clearly marked, but it isn’t hard to figure out where you are. 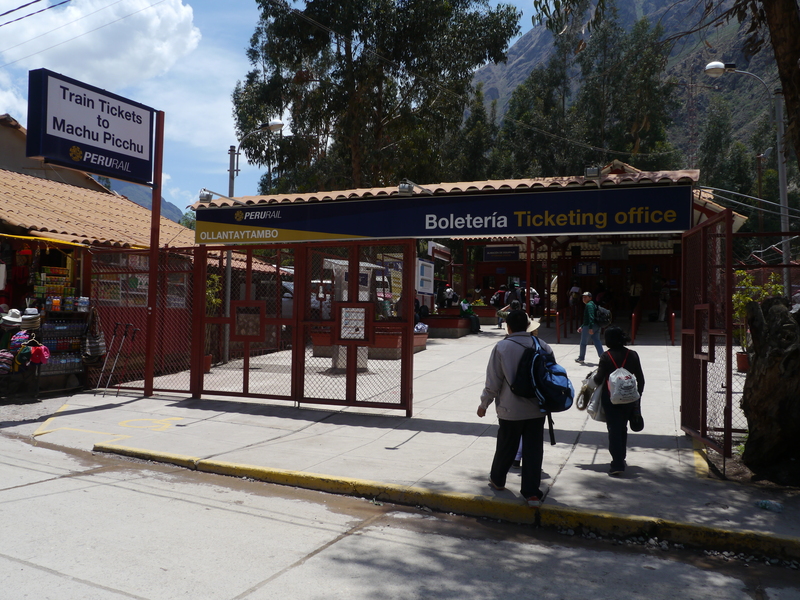 The first town of any size is Urubamba (2-3 stops, including the bus station) and some passengers will get out. 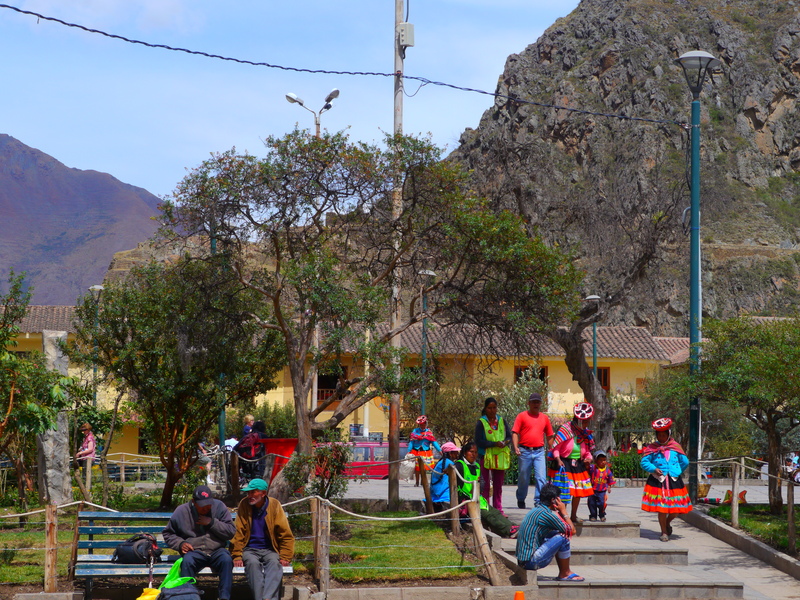 The next and last major town is Ollantaytambo and there are two or three stops, usually the second one is the train station and the last one is the main square. 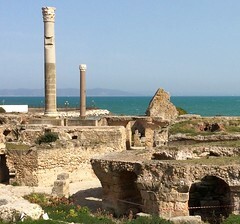 Some accommodations are located at the first stop (where the ruins are), so it is helpful to know in advance where yours is. Show the driver the name when you board (but he may or may not remember by the time you get there …). If you overshoot like I did, you can get a “moto“, a covered tuktuk type vehicle for 2 passengers and their bags, back to the first stop for 4 soles (night time price). The trip is easily walkable, but I wouldn’t suggest it at night unless you know exactly where you’re going. The streets are pretty dark and poorly signed. Note also that the street is fairly bumpy cobblestones too — far from ideal for dragging a rolly bag, neither for walking in sandals — and almost always without sidewalks. While you’re in Ollantaytambo, there is are gorgeous ruins to visit, only one requiring a ticket. But … you will have to make a ticketing choice which may mean it is best to see Machu Picchu first, and then look around the rest of the Sacred Valley. The “big ticket” gives you access to 12 sites, including museums and ruins in Cuzco. 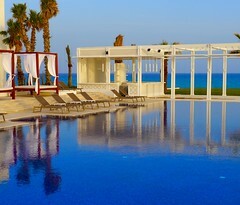 It is valid for 10 days and costs 130 soles ($44 US ). The mini ticket, 70 soles ($24) gives you access to four specific Sacred Valley sites but is only valid for 2 days (really, the Peruvian government needs to change this!). You will need to drive to the other sites (taxi or collectivo), so keep this in mind in your planning. The unit of currency in Peru is the nuevo sole, just called the sole, and pronounced “sole-ay”. One sol is pronounced “soul”, and the S seems to be optional in the plural. Remember that in Spanish, two LLs are pronounced as Y. 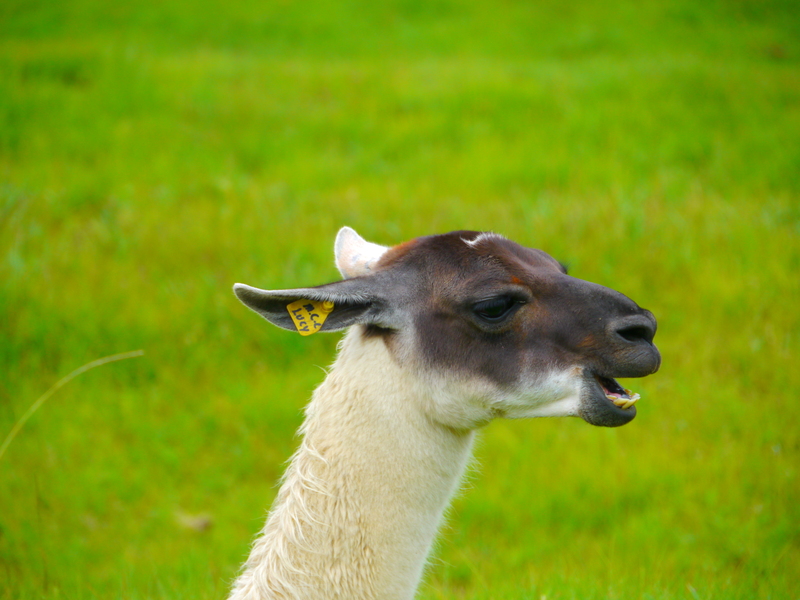 A llama is a “yama”; chicken, pollo, is “poy-o”, not like the sport of polo. 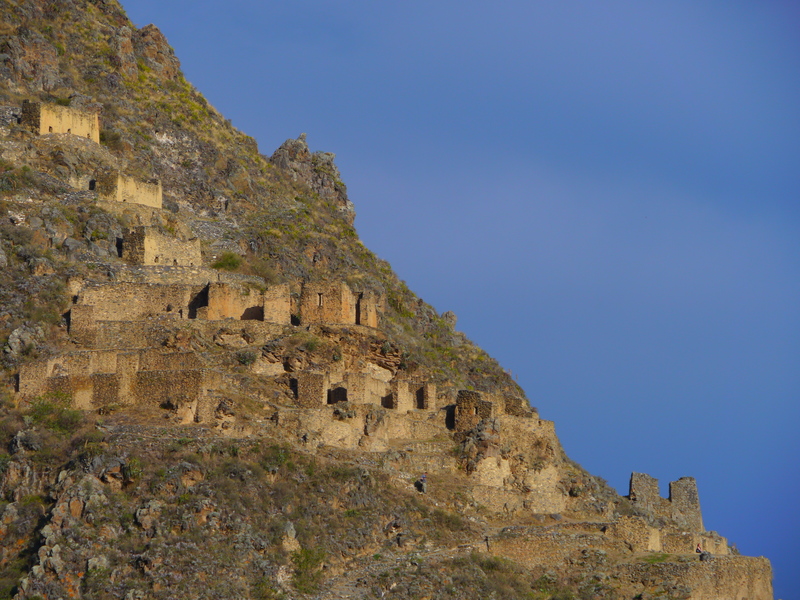 So, Ollantaytambo (which gringos refer to as Olly to each other without problem) is pronounced “O-yay-tay-tambo” or the short form “Oy-anta”. If you’re not sure if you’ve reached the end of the bus trip, ask your fellow passengers “terminale?” “ter-mee-nal-ay”. Not feeling confident? Just write everything down and show it to people. They’ll make sure you’re in the right place. The last leg of the trip must be done by train to Aguas Callientes. While there are two class choices, plus the Hiram Bingham luxe train, you will probably just pick whichever timetable suits you better. I didn’t notice a huge difference between the trains. My Expedition class tickets were $56 US to Aguas Callientes and $48 US to return to Ollantaytambo (always charged in US $ and you need to show a passport). I bought my ticket two days in advance without problem (at the train station in Ollantaytambo; credit cards accepted). You will want to book a bit further in advance if you are travelling in peak season. Keep in mind that if you wish to see the sun rise at Machu Picchu, you will need to sleep in Aguas Callientes the night before your visit. The first train from Ollantaytambo leaves at 5:07 a.m. and arrives in Aguas Callientes at 6:34 a.m. But there will be a queue to board to bus up to Machu Picchu which will take about half an hour, and then the ride itself takes about 25 minutes. To be in the first group at Machu Picchu, you need to be waiting at the bus stop in Aguas Callientes at about 5:15 a.m.
4. 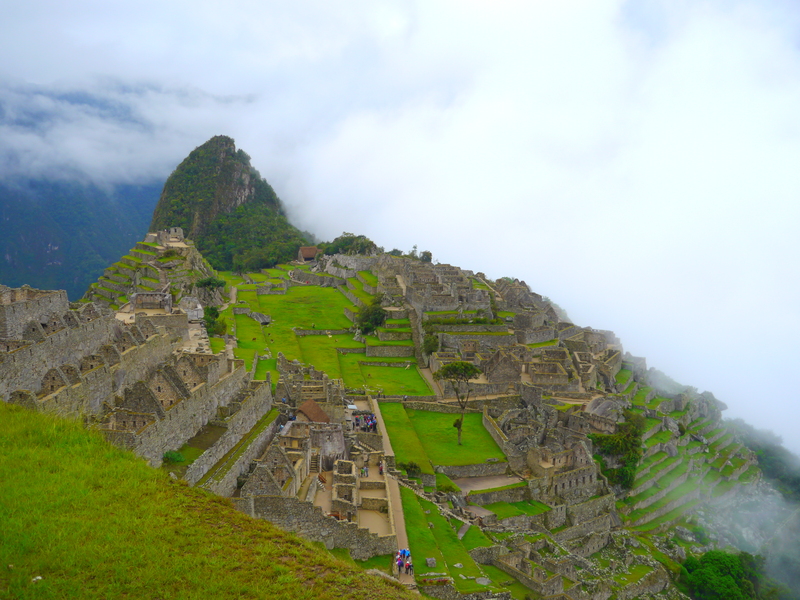 What time should I be at Machu Picchu anyway? In the Sacred Valley, the sun rises around 5:30 a.m. But because of the way the site is situated, the sun doesn’t break out behind the mountains up on Machu Picchu until about 7 a.m., give or take 10 minutes depending on the time of year. Keep in mind that Machu Picchu is in the cloud forest, so you may not get an actual sunrise at all. Once you get off the bus, it takes about 15 minutes to show your ticket (and passport – don’t forget it!) and climb up to the Watchman’s Hut, which offers the best views for the perfect sunrise photo. While the site does get busy as the day goes on, it is possible to still get a photo without noticeable people (not without people, mind you) at many times of the day if you’re patient. And having a few people (or llamas) in your shot is actually very useful for showing scale. So, do you need to be on the first bus from Aguas Callientes? I say no. Unless you have a ticket for the 7 a.m. to 8 a.m. slot to climb Huayna Picchu. Or if your only choice is to visit Machu Picchu on a Sunday. On Sundays, Machu Picchu is open to Peruvian nationals for free, and is therefore the busiest day. Tickets: you will need two tickets to see Machu Picchu — the site pass and a bus ticket. Unless you want to waste some of your Machu Picchu day in ticketing lines, purchase these in advance. Site tickets are sold in soles, not US $, and prices for foreigners are as follows. You will need to show your passport to buy the ticket and enter the site. In Aguas Callientes, credit cards are NOT accepted. But there is an ATM nearby. Basic plus Machu Picchu Montaña (mountain): 140 soles, $47 US. You must start your climb up to the mountain before 11 am. The view is spectacular from the top, assuming it isn’t clouded in like the day I visited. There is not much to see on the path up to the top. The hike isn’t difficult, just requires stamina at altitude. Basic plus Huayna Picchu: 150 soles ($50 US). Only two groups of 200 are allowed daily. You must arrive at the base of Huayna Picchu before the cut off time on your ticket (8 am or 11 am) or you will not be allowed to climb. This climb can be a bit tricky and is not recommended for people who are afraid of heights. You can buy your site ticket in Cuzco, in Aguas Callientes, and online at http://www.machupicchu.gob.pe. You cannot buy your ticket at the entrance to Machu Picchu itself. This TripAdvisor post has helpful info: http://www.tripadvisor.ca/Travel-g294318-c165226/Machu-Picchu:Peru:Getting.Tickets.html (especially if you want to buy online and don’t read Spanish). I bought mine in Aguas Callientes two days before my visit. There were still tickets available the day before too, but this was not peak season. The ticket office is just off the main square, to the right and uphill, when you are facing uphill. You will also likely want a $19 (return) bus ticket to and from the site, though you can walk if you want. Buses run continually so there is no need to pick a time. You can just take the bus up and then walk down at the end of the day; the one-way bus ticket is $10. If your sore feet change your mind at the end of the day, you can buy a ticket down from the bus stop at Machu Picchu for $10. Bus tickets are sold in US dollars. There are two kiosks in town to buy them, on either side of the main street going up along the small river (perpendicular to the railroad tracks), only one of which seemed to be open at a time. You can only buy next day tickets after around 3:00 p.m. There will likely be a short lineup to help show you where the kiosk is, though any of the helpful security / traffic guys will point you in the right direction. Inexplicably, the bus ticket has a nice fancy picture on it and the site ticket is just a computer print out. Passport, site ticket, bus tickets: You will need your passport to both purchase site tickets and to gain entrance into Machu Picchu. Just before leaving the ticket check point at the end of the day, you can stop by a little table to stamp your passport too (note: in some countries it is illegal for citizens to stamp their own passports). Obviously, you will need your site and bus tickets too. Sustenance: Technically, you are not allowed to bring food into the site, nor plastic bottles for drinks (re-usable water bottles are fine). In reality though, no one will check your bag and site employees don’t seem to bat an eye at people having a snack inside the grounds. You will want to bring both food and water. Your hotel will likely provide you with a big packed breakfast anyway. You can exit the site to buy overpriced food, but why would you want to do that? Under no circumstances should you leave garbage though! Bring a plastic bag to put your wrappers etc in and then deposit them in a garbage can near the bus stop and washrooms (there are none inside the site). Bathroom money: There is only one washroom at Machu Picchu, and it is near where the bus drops you off. It costs 1 sol to get in. Don’t be caught short! You would be wise to pee when you first arrive to avoid having to walk back and exit the site in the middle of the day. You’ll also face the traveller’s dilemma of how much water to drink to avoid dehydration but not to have to pee too frequently. Good luck. Shoes: You do not need hiking boots to see Machu Picchu (if you hike the Inka Trail, you will though!). While you want something comfortable, there is no need for the bulk or weight of hiking boots. You will want something with a good grippy sole, as some of the stones are a bit slippery when damp from the dew / drizzle. The terrain is a bit uneven, so you’ll also want a shoe that you don’t slip out of easily. Running shoes or strap-on sandals are fine. As I travel really light, I wore these little sneakers and was perfectly happy (photo to come). Rain and sun protection: The weather at Machu Picchu changes in an instant. Clouds will roll in obscuring your view of the ruins, and two minutes later it can be clear. You will want a rain jacket and a bag to put your camera in if it gets a little wet. In some locations the wind can be a little chilly. The early morning wait for the bus will be cold. If the sun does come out, remember you are near the equator — it is strong. Even through the clouds. Sunscreen and a hat please. That’s my swollen ankle and calf, not my knee and thigh! Bug protection: While they were worse in Aguas Callientes than at Machu Picchu itself, you do not want to get bitten by the tiny fruit fly-like bugs that live here. You won’t feel them biting, but you’ll have ugly red welts for days, and itching for two days. If you get bitten enough in one spot as I did, your legs will also feel bruised and painful. Wear bug spray, and even better, don’t leave skin, especially ankles, exposed. On a November afternoon at 3:00 p.m., I was out for 30 minutes in Aguas Callientes to get cash and buy my tickets. My ankles were exposed and I did not wear bug spray. I had 30 bites. Yes, in 30 minutes. And bugs normally don’t like me. And my ankles were painfully swollen for days. Not pretty! You don’t need a walking stick: There are walking sticks for sale in Aguas Callientes and at the train station. You will not need one for Machu Picchu, unless a) you normally need a walking stick or b) you have difficulty walking up or down stairs without relying on the handrail. Walking sticks are allowed in Machu Picchu technically only for the elderly or disabled. The points can cause damage, so they are discouraged. Do you need a guide? It depends on how you like to look at stuff. I was very happy without a guide so that I could go at my own pace and retrace my steps to catch the light as it changed throughout the day. 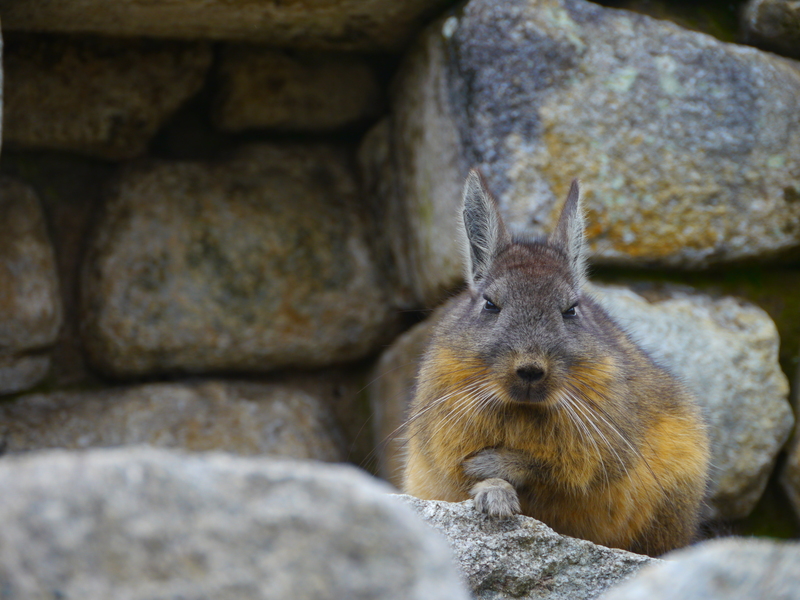 I eavesdropped on a few groups at key points to get a better understanding of what I was looking at, and I asked a couple questions of guides and other tourists (“do you know the name of that animal?” “Chinchilla”). Keep in mind that there is very little written history about Machu Picchu, and guides tend to make up details in stories to illustrate. I overhead many different versions of what a particular stone meant or how a building was used. If you do want a guide and are travelling independently, you will be approached in the lineup for the bus, so you can decide late in the game. No big bags: A day pack is fine, but if you’re hiking the Inka Trail, you’ll need to check your bag. Your hotel, regardless of class and whether it is in Cuzco, the Sacred Valley or Aguas Callientes, will store your bag for you, almost always without charge. Tripods are tricky: Machu Picchu rules, printed on your ticket, say you need to pay an extra fee to bring in a tripod. I saw no one at the site with one, so I have no idea how you go about doing this. I assume the rules apply for a monopod too. You could probably get away with a small one that you take inside your day bag. But there are plenty of walls and rocks upon which to rest your camera. And you will find helpful people everywhere (and I mean everywhere!) to snap the ubiquitous photo of you in front of the ruins. Unless you are staying in Aguas Callientes that night, you will also need a same-day train ticket to get you back at least to Ollantaytambo, if not Urubamba, or Cuzco. The Expedition (backpacker) train leaves later than the Vistadome. There are a dozen trains per day, the first departing Aguas Callientes at 5:35 am and the last at 9:50 p.m, arriving in Ollantaytambo at 11:27 p.m. The challenge is that you need to book your train ticket in advance, so you will need to decide in advance how much stamina you’ll have before you want to crash in your hotel bed. Once back in Ollantaytambo you have choices. I recommend staying in town for a couple days and seeing the ruins (see step 2 above re ticketing decisions), and/or going to Urubamba or other Sacred Valley towns. Or you might want to head back to Cuzco. If you want to catch a collectivo, walk past the majority of the aggressive touts when you get off the train. On your right, you will soon see a parking area with minivans. Ask there (you will likely be approached) for the collectivo to the town that you want. 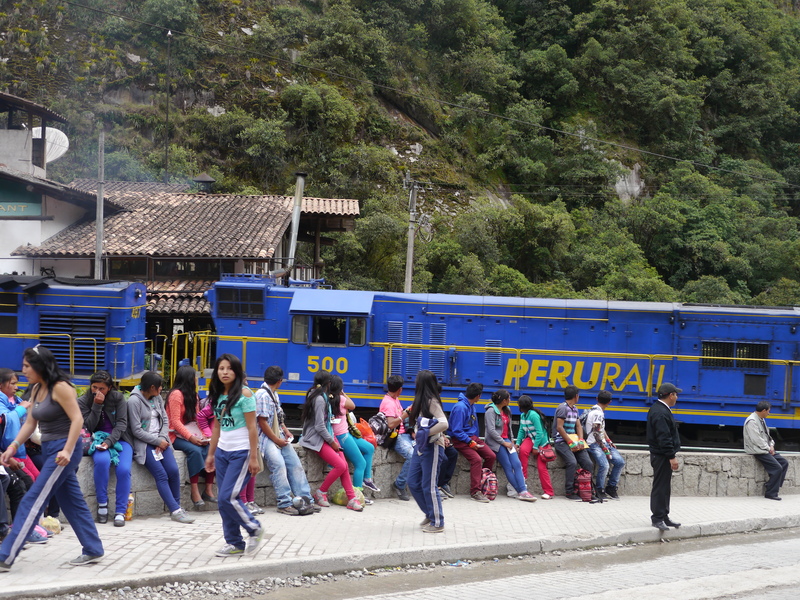 I was charged 5 soles ($1.75 US) to go to Urubamba (the price quoted closer to the train was 20!). You can also arrange a taxi here if that’s what you want. Again, the further you walk from the train, the more negotiating power you have. If you are staying in Ollantaytambo, you can walk to your hotel if you’re not carrying too much stuff. The walk is slightly uphill, the road isn’t too smooth, and you’ll be in the hot sun. A moto tuktuk will be about 3 to 5 soles (around $1). One-way flight from Lima to Cuzco: $102 US on Peruvian Airlines. (Return should be about the same, but I flew to Lake Titicaca, not back to Lima). Taxi from Cuzco airport to collectivo station: 20 soles ($7). Collectivo to Ollantaytambo 10 soles ($3.50). Return train from Ollantaytambo to Aguas Callientes $104 (prices vary depending on the type of train and time of trip). Entrance to Machu Picchu site: 126 soles ($42). (Soles only; buy in Cuzco, Aguas Callientes or online). Return bus from Aguas Callientes to Machu Picchu: $19. TOTAL: $182.50 US (use this as a comparison for the cost of a packaged day tour), $386.50 including return flights from Lima, but not including accommodation (which can be as cheap as $15 US/night) or meals. Did I miss anything? Have prices or logistics changed? Please share what you know! Great article, thanks for the tips! Indeed, as the hub of the Inca empire, Peru is a spectacular place to visit, with it being home to the majestic Machu Picchu, stunning Inca architecture, dazzling cloud forests, snow-capped peaks of the Andes and the mighty Amazon River. Thanks — not sure if you meant to write two versions of your comment though. Thanks David. Yes, it’s wise to be aware of scams anywhere in the world. They’re pretty easy to avoid if you know about them. Thanks Charla, assuming this wasn’t just a bot auto-comment …. This post could not have been more useful to me. I plan to travel there in early June. Thanks! Thanks Malcolm. I assume you clicked through to some of the articles on the Peru page for more tips (https://traveleater.net/2014/08/03/how-to-see-peru-travel-advice/). Have a great time in Peru! 1) Where to leave luggage ? 2) for sacred valley tour, what to see? I didn’t leave luggage, so I’d recommend you check with an official site to find your answer. Did you have a look at my Peru page (https://traveleater.net/2014/08/03/how-to-see-peru-travel-advice/) for what else to see? Your blog was so helpful. Thank you! Thank you! 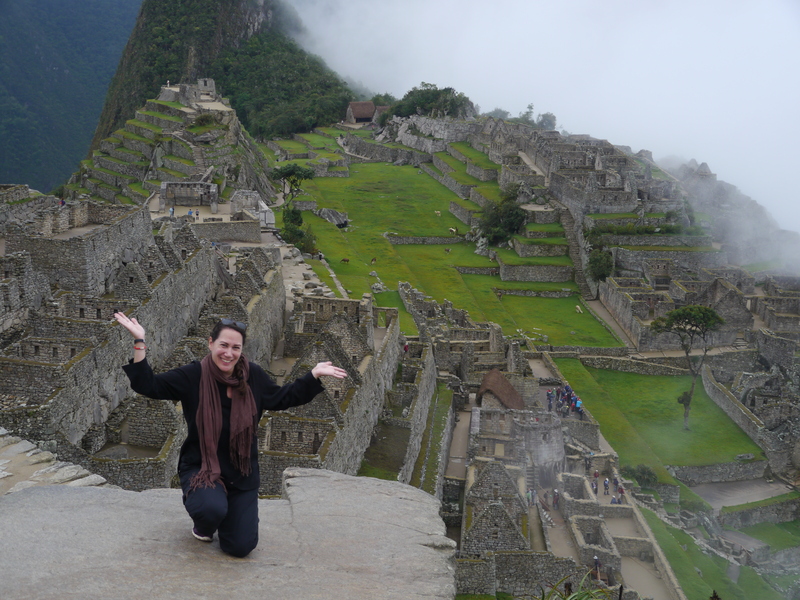 It had been so hard to figure out our trip to Machu Picchu, and we really didn’t want to book a group tour. You make it easy! I found finding info on how to see Machu Picchu independently, and on a budget, also very challenging. Glad I could help! Enjoy your trip, and if you have any tips to share on you return, please let me know. You sneaked into Machu Picchu at 2 a.m.?! That must be quite the story Boho Hobo!